…this world is also rather male-dominated. Many of the most recognised education bloggers (the head teacher Geoff Barton, and the teachers Frank Chalk, Old Andrew and Tom Bennett, for example) are men. “I try not to think about it as an old boys’ network, but it’s hard to escape the fact that it’s quite hard to crack into the blogging establishment as a woman,“ says Bansi Kara, an English teacher who writes The New Stateswoman blog. Now I have to confess I haven’t really paid much attention to that particular blog, the only time I noticed it was when she wrote a blogpost arguing for the use of mobile phones in lessons which used every poor argument imaginable, from condemning “polarisation” in opinions (as if her opinion was some kind of moderate, middle position) to throwing around words like “censorship” and “Victorian”. However, I wasn’t aware that the fact I hadn’t been hanging on her every word was because she was a woman. I thought it was because she was the sort of English teacher who would spend time in lessons getting kids to use mobile phones to make documentaries rather than, you know, teaching them English. Apparently not. In cahoots with my best buddy Geoff Barton, I’ve actually been excluding her for being a woman. And this in a medium where nobody needs approval to contribute, where the best writers will always get an audience, and where nobody even needs to state whether they are a man or woman (and many don’t and some may even lie). Actually, this argument seems so absurd that I have probably spent far too much time on it already, but I will take the opportunity to survey the education blogger landscape. As well as the martyr mentioned above, the Times managed to find time to mention only one other woman education blogger, Laura McInerney, who is (now) a doctoral student in education based in the US who blogs at http://lauramcinerney.com/ To redress the balance I thought I’d point out some more female bloggers, past and present who really deserved a mention. Firstly, it’s worth mentioning that who is or is not blogging varies over time. 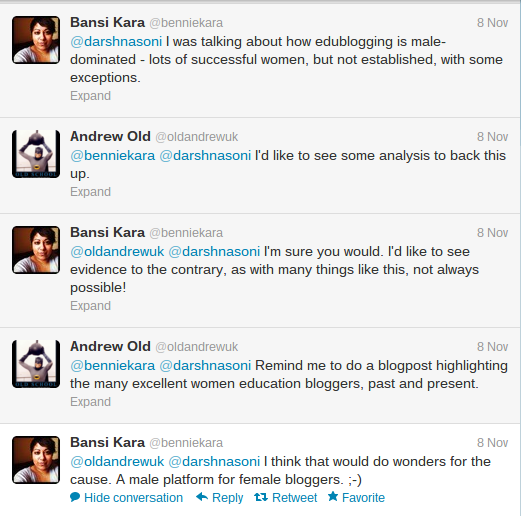 If the “most recognised” education bloggers now are male then this would not have been the case just a few years ago. Katharine Birbalsingh and The Ranting Teacher may have given up blogging, but they were both, in their time, more widely recognised that I ever was. Secondly, if they were willing to give space to a (admittedly British) blogger based in the US, then they should have also noticed who is dominant in the US education blogosphere. I doubt there’s any education blogger in the world who is more prolific or more widely read than Diane Ravitch who blogs about 47 times a day here. Other, non-UK based, education bloggers who I believe to be women can be found here, here, here and here. Finally, and most importantly we have some really good British women education bloggers, who are still blogging, who the Times failed to mention. This is an excellent, informative, if now sadly irregular, blog about teaching, education and policy by a former teacher who is now attempting to return the world to sanity as managing director of the curriculum centre. It is probably the blog I most look forward to reading. A powerful blog, clearly written by somebody who has seen the worst our dysfunctional educational system has to offer. Possibly the only blog that ever makes me think “come on, it can’t be that bad”; it is absolutely authoritative on the topic of how bad things can get and what you can do about it. A repeatedly fascinating blog from a Professor of Developmental Neuro-Psychology. At its best when pulling apart some neuro-nonsense in the media, but also an excellent source of information on SEN, education policy and academia. If my past track record on blog recommendations is anything to go by, they will all stop blogging forever within a few days of receiving this recommendation. I should note that I have deliberately stuck to blogs that I personally follow, but there is no shortage of other education blogs by women out there. Please feel free to suggest any blogs I haven’t thought of, or don’t follow. Hopefully, this will go some way towards seeking restitution for my past history of oppressing and excluding women education bloggers. As a male person I hesitate to be the 1st to comment. It never occurred to me there was a sexism angle within education. as out outstanding teachers, as are poor teachers. As to blogging? Well I guess I follow this blog and the TES pages but I used to follow a female blogger that was on your blog roll. I don’t mind if the first (and currently only) comment is from a man. I’ve had a lot of great responses to this from women on Twitter, DM and email. As the female author of one of the blogs you kindly recommended, I can only agree. There’s nothing stopping women blogging other than their own reservations about diving in to the fray. If you blog you do have to be willing to promote yourself and there will always be someone who will criticise you – in general, women are bad at doing the first and coping with the second. But blogging is a good way of developing a tougher mindset that actually will serve you well in other arenas of life. I thoroughly recommend it. Good job it was a woman saying that. Picture the response if a man had had the poor judgement to make such a generalisation in public. Fundamentally what appears to be going on here is that Ms. Kara isn’t getting as many readers or as much attention as she thinks she deserves, and is reaching for an excuse. Sadly, the one she’s concocted doesn’t tally with the reality of how blogging works – i.e. that anyone at all can do it and gender is entirely irrelevant.